Sikh history is replete with tales of valour and devotion, of fight against tyranny, help of the weak and downtrodden and a deep faith in the teachings of the Gurus. The Sikhs did not hesitate to challenge the might of a great empire and reckless invaders and fought against heavy odds. Baba Banda Singh Bahadur and his companions were taken prisoner from the fortress of Gurdas Nangal in December 1715 AD. 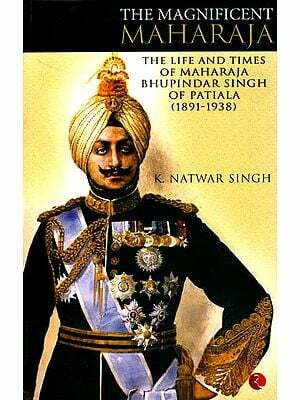 Following his martyrdom, every governor of Lahore made the life of Singhs in his territory very difficult. 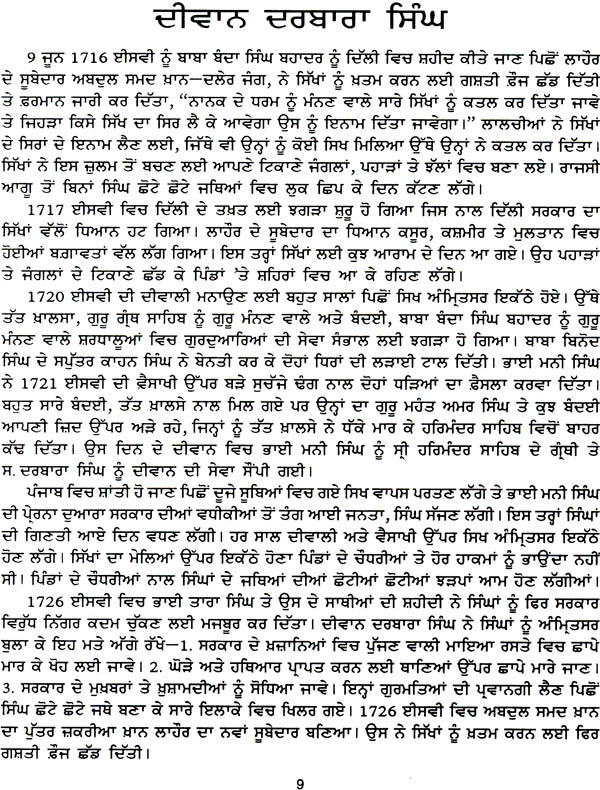 They continued deploying army patrols to finish off the Singhs and even offered rewards for Singhs' heads. At the time of need they recruited Singhs in their army but when their purpose was served, they turned after their lives with all the force. 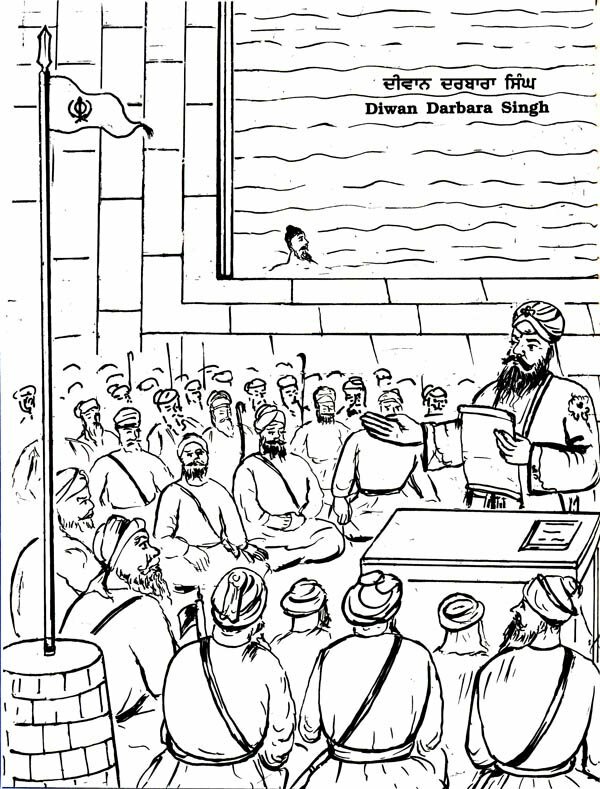 The Singhs were subjected to this type of tyranny for fifty years. In those days of tyranny, the Singhs looted Nadir Shah on his way back from Delhi with his booty in May 1739 AD. On reaching Lahore, he asked Governer Zakria Khan, "Who are these men who had harassed my army by their ambushes and raids. I want to destroy their hearths and homes." Zakria Khan replied, "Your honour, those who looted your army are called Singhs. Their homes are on horseback. They are underfed and underclothed but they are so brave that a Singh is always ready to take on the lakh. They prefer martyrdom fighting than concede defeat. They say that their Guru had bestowed upon them the rule of this county. The Guru's words must be fulfilled." On hearing this reply, Nadir Shah said, "If the Singhs are such, they are sure to get the rule of the country." The stories of victories and sacrifices of those brave Sikh chiefs who organized and led the Khalsa in those painful times and propagated Sikh religion simultaneously are described in this book, the ninth in series. 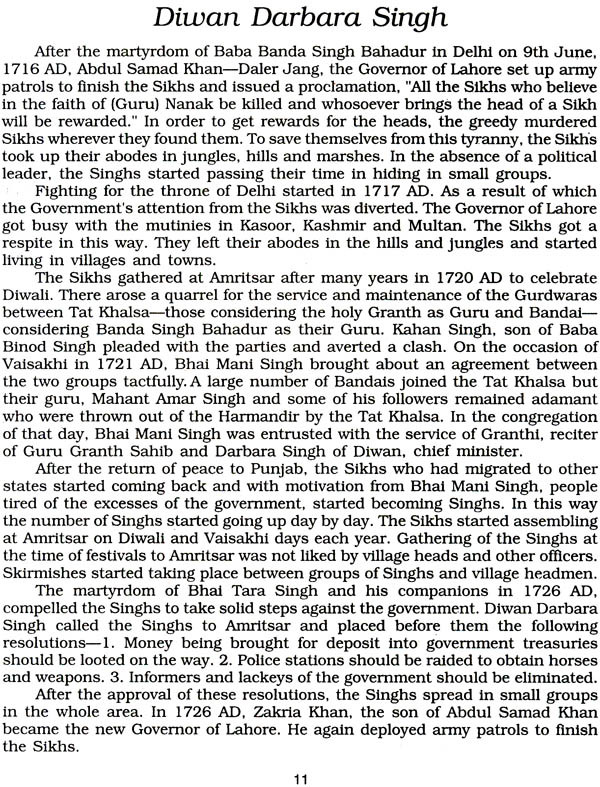 It was due to struggles and sacrifices of these brave men that Khalsa rule was established in 1965 AD. They turned their belief into reality for a second time. Hello, I have some questions for this book because I have questions to answer and can you answer them for me please? !